Recipe published for the first time. 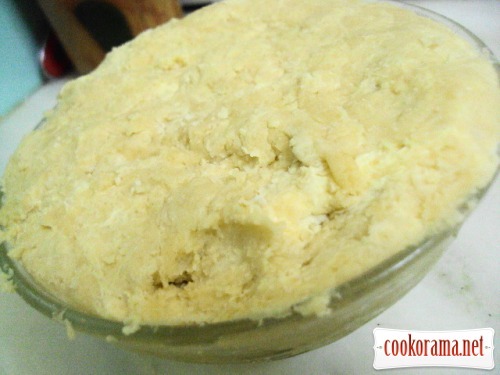 Dough: Butter cut into cubes, mix with flour and chop into crumbs. Add sugar, salt, yogurt. Quickly knead a soft dough. Cover with food film and put into refrigerate for at least 30 minutes. 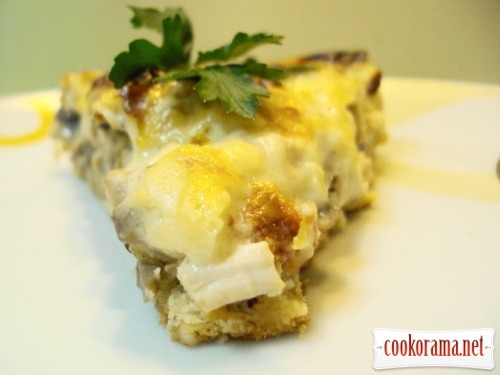 Stuffing: Wipe mushrooms with wet napkins. Cut into slices. Cut onions into cubes. Brown onions in hot oil until transparent, add mushrooms. Salt, pepper, add thyme and stew over medium heat until liquid evaporation. 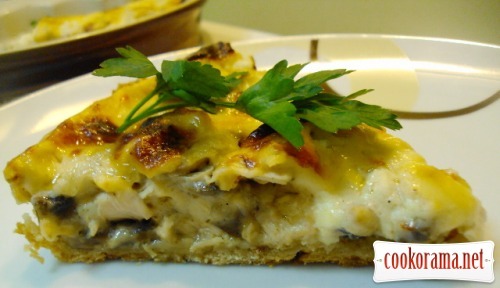 Cool and mix with diced chicken breast. 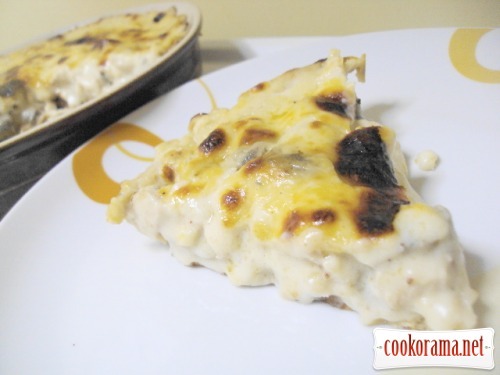 Bechamel: Melt butter and fry with flour. Slowly refill milk, stir constantly with egg whisk. Salt, pepper. Cook until thick sauce. 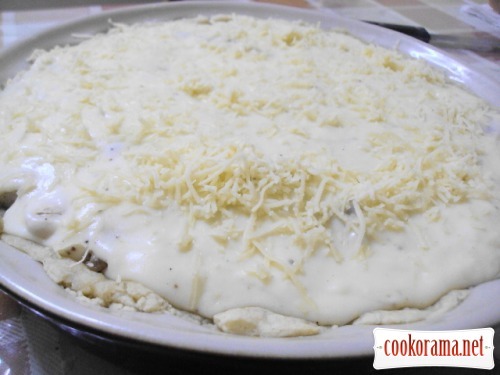 Add nutmeg and grated cheese (leave some cheese for dusting). Mix. 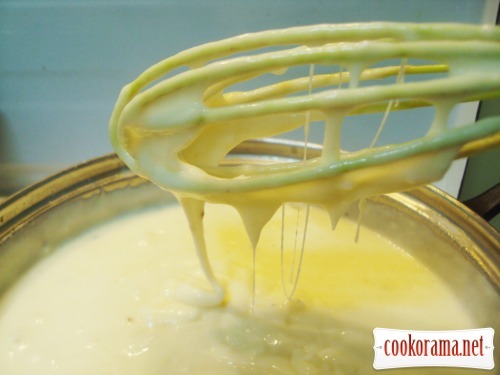 Once the cheese has dissolved, take the dish with cream off the heat. Thinly roll dough and put in a greased form. Carefully cut the excess dough along the edge of the form. 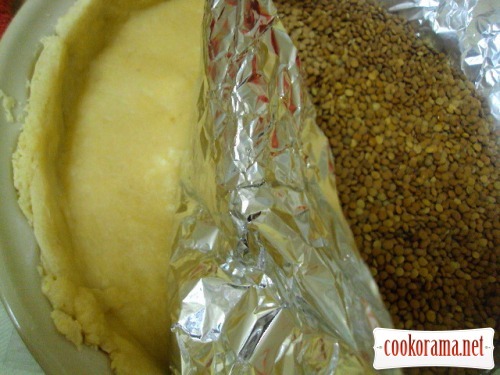 Lay a foil on a dough and put on a sinker (I have lentils). 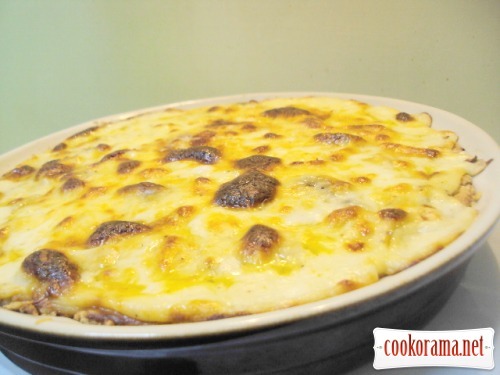 Bake in preheated oven up to 180 ℃ for 15 minutes. Take form out from oven. Remove foil with sinker. Put the stuffing on a pastry. 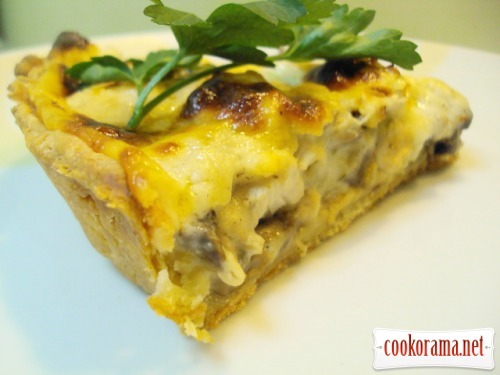 Pour sauce over tart and sprinkle with cheese. Bake at 180 ℃ for 30 minutes, until golden brown. 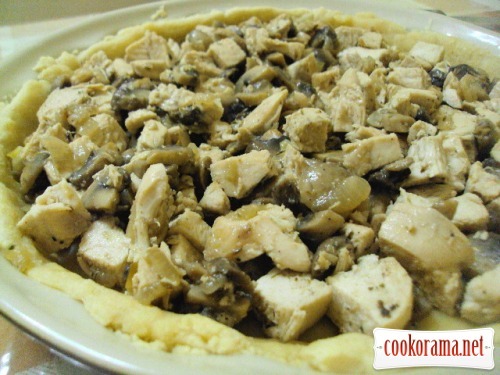 Let done tart «rest» for about 15 minutes and serve. And this is just cooled tart. Top of recipe "Tart with chicken and mushrooms"
Очень вкусно! Я бы не отказалась кусочек с чаем с утра заточить, впрочем, можно и вечером! Мы в обед приговорили. Сейчас только чай попиваю. Лариса, тарт вийшов що треба!